A legal pronouncement of death is required. If your loved one died in a hospital, a doctor can make the pronouncement. If they pass away while on hospice, the hospice nurse/physician can make the pronouncement. If the death occurred somewhere else, call 911. First responders will guide you through the next steps, which may involve taking the person to the emergency room to make the declaration or involve a mortuary picking up the body. By law, you are entitled to receive a price over the phone for the mortuary’s transportation services. Next would be to arrange for organ donation, if applicable. If your loved one has made their wishes known that they want to donate their organs (via their license or in an advance directive) you can let the hospital, hospice staff or first responders know. Notify close family and friends. It can be helpful in the case of a long illness to gather these contacts in advance and develop a communication tree so that you are not making all the calls. Be sure to include your loved one’s physicians on that list. Does your loved one have pets or dependents they were caring for? Make arrangements for their immediate care until you can determine a long-term plan. Some checklists suggest having your loved one’s powers of attorney handy. However, powers of attorney do not survive death. After death, the executor of the estate handles all financial and legal matters, according to the provisions of the will. These individuals can be the same but don’t need to be. If your loved one lived alone, be sure to secure their property, including their home, cars, boats and any other items of value. If you will not be in or near their home for a while, alert the police to the fact that the home is vacant. Consider religious customs. Some religious conventions are time-sensitive. For example, the traditional Jewish custom is to bury the deceased within 24 to 48 hours. Determine if your loved one has documented their wishes upon death. Many individuals will document their wishes in their will or trust, but that should not be the only place they are listed. Usually by the time a will or trust is located and read, loved ones will have already made the decisions about the disposition of the remains (burial or cremation) and memorial. The best way to let your loved ones know about funeral wishes is to write down specific instructions in a document that is separate from the will or trust. It is also important to let your loved ones know where it is being stored so that they can access it at the appropriate time. Lastly, request death certificates sooner rather than later. 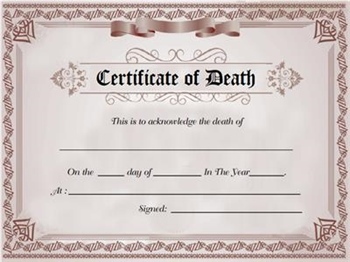 You can order certified copies of the death certificate from the funeral director or from the local Department of Heath office in the county where the death occurred. Generally, you will need one certified copy of the death certificate for each major asset, such as cars, land and bank accounts where you will need to transfer ownership. You may also need them for life insurance policies, veterans’ survivor benefits and annuities. Immediately after a death we are task-oriented. It is usually later, after much of the “work” of loss has been completed, and phone calls and visits are fewer and fewer, that seeking support from grief counselors may feel important.